Earlier this week K5HCT emailed me asking if I could model an antenna design he was thinking of building. I didn’t have an antenna modeling program and had never done any modeling so I referred him to W5AJ. 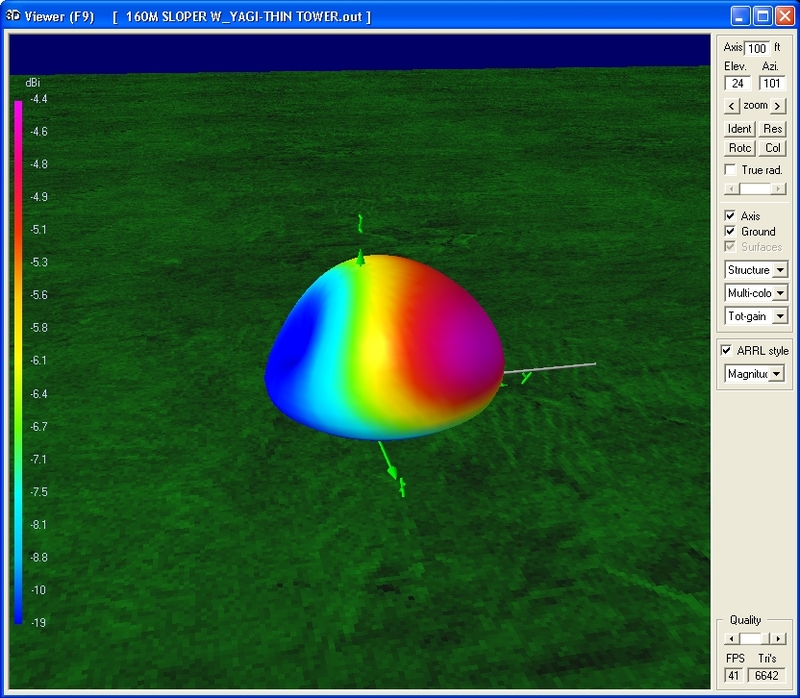 However, K5HCT’s inquiry piqued my interest so I did a search for antenna modeling software. Most hams have probably heard of and many use EZNEC. I had looked at the version that is bundled with the ARRL Antenna Book but never really figured out how to use it. Plus, the ARRL version only works with the antenna files included with the antenna book. You can modify those files but if you save the changes then the program reverts to demo mode when you re-open those files. My search turned up a free program called 4nec2. 4nec2 was written by Arie Voors for his own use but has made it available as freeware. This is one COOL program! In addition to numerous modeling files included with the program it can also open and convert EZNEC files. So, all the files included with the ARRL Antenna Book are available to use as well as many files on the internet. I’ve spent the last few days learning a little bit about antenna modeling and thoroughly enjoying using 4nec2. A good place to start is a series of four articles written by L.B. Cebik, W4RNL (SK), called “A Beginner’s Guide to Modeling with NEC” published in QST in November, 2000, through February, 2001. These articles are available for download from the ARRL. You have to be an ARRL member to access those files but if you’re not a member you may be able to find those articles on other websites. One of the first antennas I tried to model was my 160m antenna I wrote about in a previous article. KB3X had commented he modeled it with EZNEC and found all the RF went straight up. I found an EZNEC file in the ARRL Antenna Book files to start with. 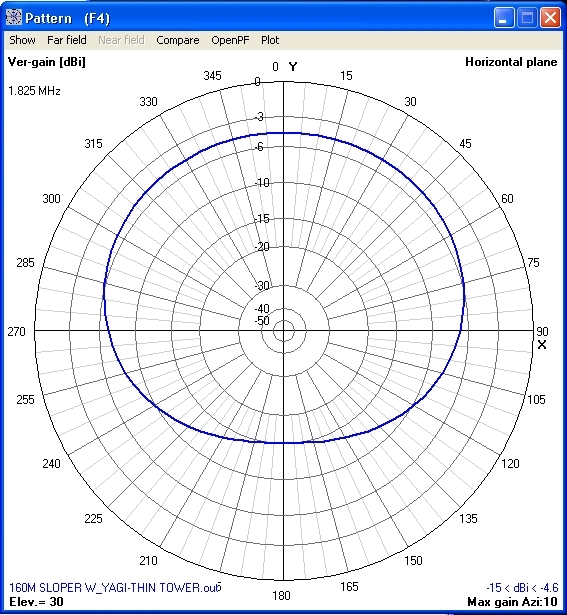 I used an 80m sloper with a 3 element yagi on top of a tower. I deleted the radials, lowered the sloper wire to 8′, and extended the wire out to ~130′. This seemed to give reasonable results but the SWR was quite high. 4nec2 has an optimizer so I ran that to optimize the SWR. 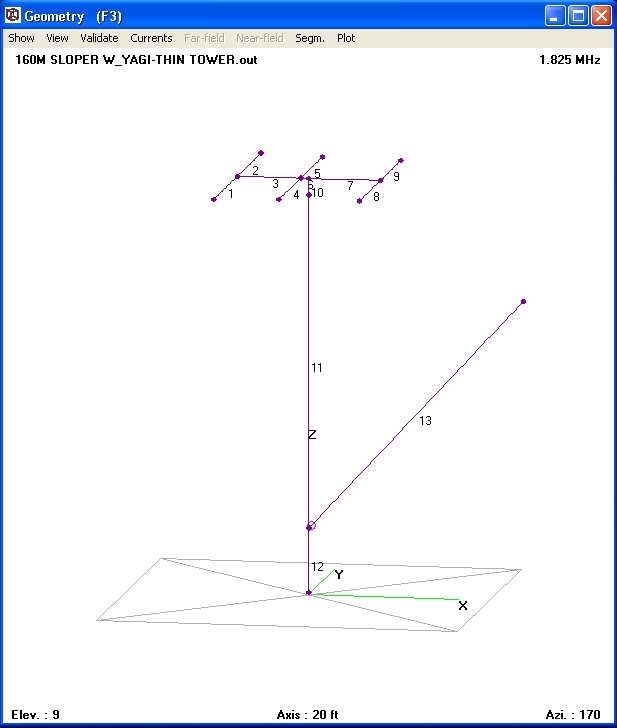 The optimizer came up with 161.7′ for the sloper wire length which gave an SWR of 1.29:1. In reality my wire is about 125′. I haven’t been able to figure out what I can change to make the model come out closer to reality. I suspect it’s something to do with the tower base being in concrete and it’s relation to ground. For a comparison I used the ARRL version of EZNEC and made the same changes to the 80m sloper file. I found EZNEC and 4nec2 results were very close. 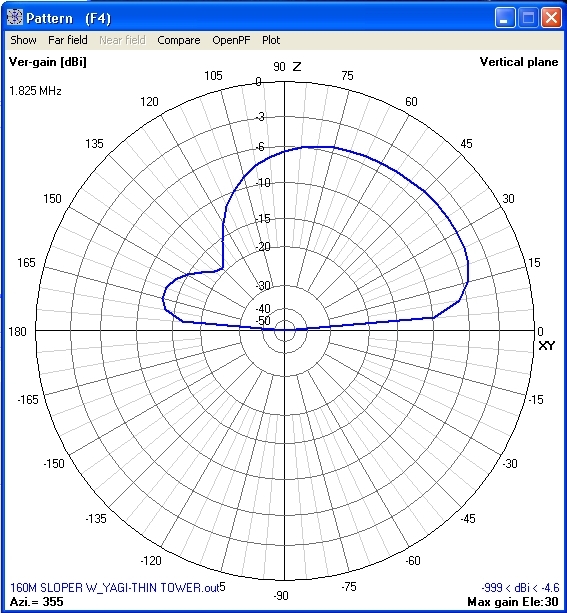 Below are some of the graphics of my 160m antenna from 4nec2. I highly recommend 4nec2. It’s a great program! This entry was posted in Software by N5NA. Bookmark the permalink.